Q&A with Beth Wilson, Director of Early Learning Initiatives! 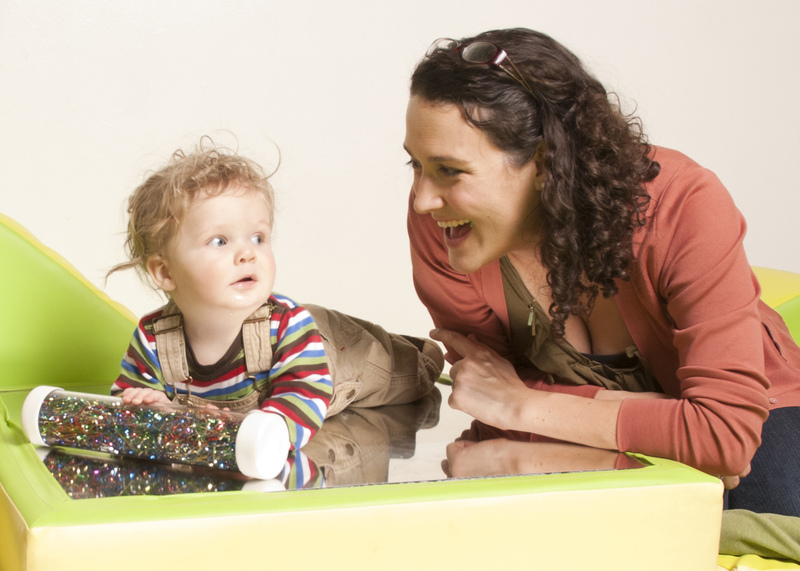 If you’ve ever been to the Pritzker Playspace- our exhibit for babies, toddlers and preschoolers, you’ve probably shared a chat and a laugh with Beth. What made you interested in early childhood development? I went into early childhood education because I had been in formal education for elementary education and realized in that program that I wasn’t so much interested in teaching kids what they should know but helping kids grow and develop at their pace and through play, so early childhood is where that fits in. 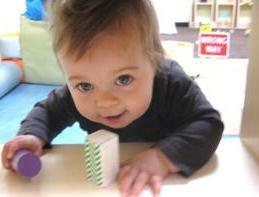 I think early childhood is so wonderful because you are able to work with children in such a formative stage. It’s a rapid period of growth and development and amazing things happen in the first 8 years of a child’s life. And I am interested in helping children grow into smart, happy, healthy people! What is something people may not know about the Pritzker Playspace? Well, what is really great is that the space is set up to be just right for babies, toddlers and preschoolers. The kids are super engaged, in this intimate enclosed space, while parents have great conversations. They know their children are safe, they can see their children and they are playing at the right level for them because there are no big kids in the space. Parents talk with us as facilitators and with each other, and share ideas about parenting. They talk about their birth stories, the issues they are facing and it’s just a really cool community. So it’s much more than just a space to come play, it is a place to connect with other people. It [the playspace] is really fluid, the kids self-initiate and the families self-initiate. And I think that is what is most surprising, that you may leave having made a friend or gotten a new idea about what to try at home. Do you have any favorite moments in the playspace? One of my consistently favorite things is when kids come over and over again and we see them once a week for the first 5 years of their life. We have had several families who have grown up here, who feel a part of it, who come in and tell us about their week. They are excited to play and explore, so that is the best part I think of what you get in the playspace. Even just today, looking around the space, there were moms talking to each other, nannies talking to each other, I was talking to a dad, just all these great conversations and then I look around and there are like 7 people breast feeding, just so relaxed, so comfortable, their kids are happy. Those are my favorite moments when I look around and think, wow we a really are creating a community here. You are an early childhood expert and the mom of an awesome 3 year old (with another baby on the way!) is there anything you didn’t feel prepared for when you became a mom? A part of parenting that was tricky and surprising is just how much emotion you have tied into this relationship with your child and how much you learn about yourself and how much you learn about interaction and your own feelings. So sometimes the things that I “know” given my studies or what the research says is different than what is coming to me naturally because of my own feelings or emotions. It illuminated the complexity of parenting. There are so many grey areas and parents are just really trying to do their best all the time and it’s a really hard and important job. I think it makes me more thoughtful in my practice. I think as long as you are coming from a place of love and then taking time to reflect, you are going to be an awesome parent! Mary Sue Reese, Early Learning Program Manager at Chicago Children’s Museum, shares her experiences of watching our youngest visitors taking “safe risks”. I’m sitting on the floor as I watch a toddler climb onto a tall stool and slowly stand up. She looks like a strong and stable warrior as she makes her ascent to vertical. Her mother, along with every caregiver in the Playspace, watches her perform this feat. As soon as she makes it to standing, she squats down confidently, climbs off the stool and continues to play. There wasn’t a single cry out to “Be careful!” or an outburst of praise after she successfully descended; instead, her mother described why she had chosen only to observe. She explained that it was safer for her child to have the opportunity to challenge her body and master skills. She had observed her daughter practice this skill before and sometimes felt judged when she allowed her child to take similar risks on the playground. On another occasion I observed a young child attempt to sit in a child-size rocking chair. Her limbs became tangled as she climbed forward on the chair and attempted to maneuver herself around. Eventually, the child untangled herself independently and crawled out of the chair. At Chicago Children’s Museum, even the youngest visitors have opportunities to take safe risks and challenge their growing bodies with the support of confident caregivers and CCM staff. When infants are allowed to move in their own time and in their own way, they explore the many ways their bodies can move without restriction, and toddlers who seek out challenging opportunities are empowered to advance their abilities and gain confidence as independent movers and thinkers.